CyberLockers are online services such as Rapidgator.net, Netload.in, FileOM.com, Uploadable.ch, etc that allow anyone to upload and store or share files. These services can be quite useful because a user can quickly upload a file and share the link publicly for anyone to download the uploaded file to their computer anonymously without being required to sign up for an account. Cyberlockers aren’t as popular as they used to be during the RapidShare and Megaupload era because some sites like MediaFire have turned into a legitimate file storage service while the unfortunate ones such like FileSonic and Hotfile have been shut down by the authorities. Nevertheless, these websites will continue to pop up because it is a very lucrative business. Although anyone can upload or download the files from these one click hosting websites, the general rule is only the person who uploads the file knows the link to download or delete the hosted file. If the download link is never shared publicly by the uploader, it will never be discovered by a search engine robot or another user. This is why a built-in search feature is never found or implemented on the cyberlocker websites. Fortunately there are third party cyberlocker search engines available for anyone to search the files on different file hosting websites and here we have 5 of them. FilesTube is probably the most popular cyberlocker search engine that allows you to search for different file types ranging from a video format such as AVI to an Android application package file (APK). You can narrow down your search results by using the filters which are available at the results page to select the file hosting websites, file size, date, and extensions. The search has an auto suggest feature and the result page shows a lot of useful information such as file extension, date added and last checked, alternative links and the source. You need to be very careful with the download buttons and the advertised premium links as most of them will point you to download an ad-ware. You will know that you are at the right website if the website’s URL matches the domain name that is stated under Host. There are two versions of General-Search which are found at the .com and .net domains, each with a different web design, but they are actually the same because the search results are identical. 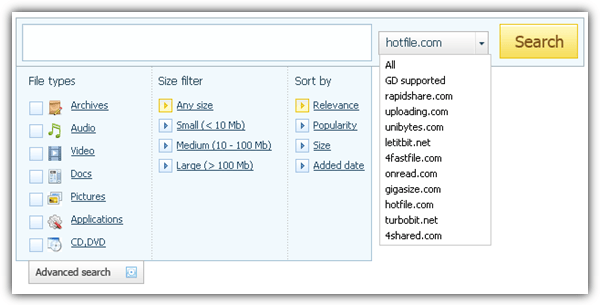 The .com version of General-Search allows you to select the file types, size filter, sorting preferences and the file hosting website. Clicking the correct download button in General-Search can be quite tricky because only one small download button is the correct one while the rest points you to download their adware. You should also avoid clicking on any buttons with the word “sponsored”. Instead of being another cyberlocker search engine, ShareDir has an interesting feature where free registered users are given 500MB bandwidth to directly download files as premium users from supported websites. The result pages also aren’t bombarded with tricky advertisements. There are 2 buttons on the result page which is “Download” and “Download with waiting”. If you’re logged in, clicking the “Download” button will request ShareDir to act as a middleman to attempt to download the first and then upload it to you once it has finished downloading. As for “Download with waiting” button, you are forwarded directly to the cyberlocker website that is hosting the file where you’ll probably have the option to either download as free or a paid premium user. FilesPart is one of the very few cyberlocker search engines that places its advertisements sparingly. You will not find fake download buttons but only one sponsored fast download link located just above the real direct download link of the cyberlocker website. The search option allows you to select the specific cyberlocker sites that you want to search but some on the list such as Wupload, Hotfile, Uploadstation, Oron and Zshare have already stopped the service. Fortunately if you have an adblocker addon such as Adblock Plus installed in your web browser, the non useful sponsored links will be automatically removed from the webpage, leaving you with only the legitimate download links. Anything to do with web search will not be complete without Google as they are currently the most powerful search engine. Using the proper advanced search operators, you can perform very specific searches to find what you are looking for. To get results from a certain domain, simply use the “site” operator. An example of displaying only results from rapidgator.net, the search command would be site:rapidgator.net followed by the keywords. 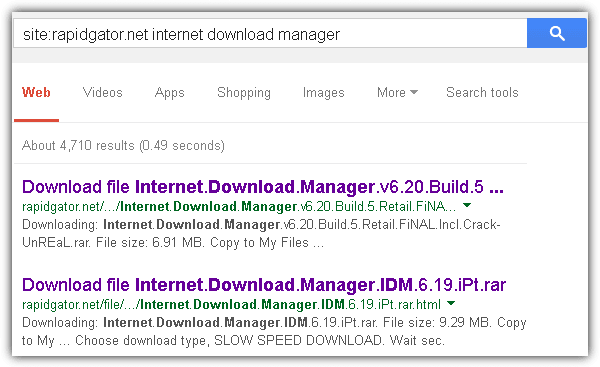 The screenshot above shows the use of Google search engine to find Internet Download Manager hosted in rapidgator.net. Important Note: We found over 30 cyberlocker search engines available today but have filtered out those that use Google’s (CSE) Custom Search Engine service and also those that we considered nearly impossible for a normal user to visit due to the large amount of advertisements or they’re trying very hard to trick the user into downloading adware with fake download buttons. Schemas provide users with an enhanced experience where they are presented with specific details about a particular company or organization on search engine results pages (SERPs). With this tool, you can customize how your results, including your reviews, operating hours, events, etc., will appear on Google and other search engines. You can also integrate the schema code easily – it’s as simple as copying and pasting. The tool also has a free WordPress plugin version. If you like this tool, there’s also a Scheme app which you can try for free for 14 days. There are multiple price structures depending on your current needs / business size. The Web of Trust extension (mywot.com) blocks filespart.com for being suspicious, not trustworthy, and for containing adult content. The Webutation ration for filespart.com is 60. The top rating would be 100. WOT is based wholly on user opinions, and user opinions are not always right, we place very little value in WOT these days. filespart is probably about as untrustworthy as Google, Yahoo or Bing, in other words you can find suspicious and untrustworthy (and adult) content if you look for it. Thanks Raymond! Wish you were posting more frequently. Another caution, many of the target sites are even more dangerous than the search engine used to find it. Most of my searches point to 4shared.com. While 4shared.com does not index other sites it has it’s own index. Since most of my results point there I often search there before using a broader search engine. I have been using FilesTube foe several years but it is now defunct. This is really useful. Thanks Raymond. Actually there is more..so be careful when using search engines..
Great list Raymond. Thanks for sharing. thank you RAYMOND . I need this ! whoa .. I don’t know almost all of these search engine .. Thanks a lot Raymond. Great compilation. Hi Raymond, the info is priceless, many thanks. Great work. I really need this one. wow! this is great raymond! thanks a lot!